Underneath the lush tropical jungles of Playa del Carmen lies a subterranean world like no other. Here fresh water channels run freely in a massive underground river system, where the limestone walls have been carved for millenia. Thousands of years of carving has created a fantastic collection of caverns (cenotes) filled with stalactites and stalagmites that will leave you in awe. 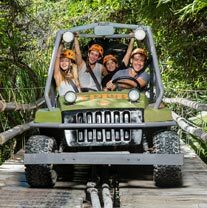 THE BIGGEST SELECTION OF CENOTES TOURS IN PLAYA DEL CARMEN! Pronounced say-NOH-tays, cenotes are openings in the ground that allow entry to this magnificent system of freshwater rivers and caverns, with totally transparent fresh water, unlimited visibility, and a constant year-round temperature of 76 degrees. Cenotes come in different shapes, sizes and depths - some are nearly flush with the ground, like a pond, while others are deep below the ground, requiring ladders or even rappelling to enter. There is nowhere else on earth where you can see such magnificent underground scenery, this is something totally unique to the Playa del Carmen area. As such, it should be high on your list to experience. All of these tours include exploring, snorkeling or scuba diving in these underwater creations - it is so different to see the stalactites and stalagmites under the water. We offer the largest selection of cenotes tours in Playa del Carmen. Click the links in the boxes above to explore this hidden world. EXPERIENCE THE AMAZING CENOTES OF PLAYA DEL CARMEN!